Synopsis (from Publisher): Henry “Biggie” Abbott is the son of one of Finch, Iowa ‘s most famous athletes. His father was a baseball legend and his step-dad is a close second. 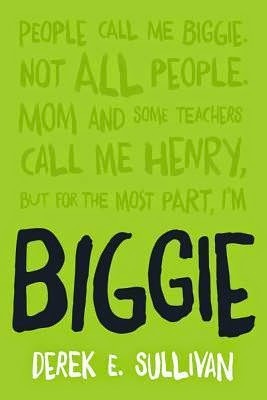 At an obese 300+ pounds though, Biggie himself prefers classroom success to sports. As a perfectionist, he doesn’t understand why someone would be happy getting two hits in five trips to the plate. “Forty percent, that’s an F in any class,” he would say. As Biggie’s junior year begins, the girl of his dreams, Annabelle Rivers, starts to flirt with him. Hundreds of people have told him to follow in his dad’s footsteps and play ball, but Annabelle might be the one to actually convince him to try. What happens when a boy who has spent his life since fourth grade trying to remain invisible is suddenly thrust into the harsh glare of the high school spotlight? "How to create a great space for inspiration while writing"
I have writing spots and I have inspiration spots. Since graduating from college in 2005, I’ve never worked in the town in which I reside. Currently, I drive 20 minutes to work every day from my home in Kasson, Minnesota to my work desk in Rochester, Minnesota. Most days, I will outline my stories on the commute. My mind will work through scenes. I will say character names out loud to see if they sound cool, dumb or ridiculous. I’ll speak dialogue to myself to see if it sounds realistic or corny. I can only imagine the amount of people who have passed me on Highway 14 and just laughed. A few years ago, someone suggested that I travel with a digital recorder to tape my story ideas, so I wouldn’t forget them. It’s such a good idea; I can’t believe I haven’t done it yet. When I do sit down and write, I need to block everything out. I love to wear headphones and listen to music in a coffee shop or break room. I love to write alone with a cup of coffee or glass of iced tea or a can Diet Dr. Pepper at my side. Or on tough days, all three. Writing at home doesn’t work right now. Plus my office became a nursery. Luckily for me, I have found some wonderful, quiet coffee shops to transcribe the ideas and dialogues I came up with on my commute. I know it is cliché, but I like ordering a coffee, finding a table by a power outlet and crafting a novel at my local Caribou Coffee. Who needs an office? or a signed copy of the book!